The celebration was a complete surprise for Patricia Mancuso, recipient of the 2019 Lead. Learn. Proclaim award for the Diocese of Camden. Mancuso was honored in style by the Saint Mary, Williamstown, community where she has been principal since 2011. With 450 students, Saint Mary’s is the largest grammar school in the diocese. Following Monday’s Catholic Schools Week Mass, Schools Superintendent Mary Boyle addressed the community to thank Mancuso for her years of service and contributions. 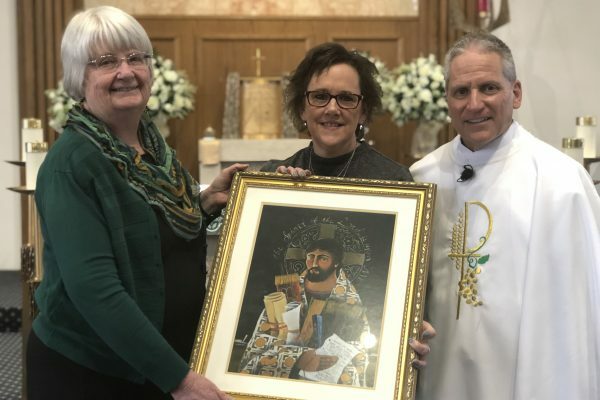 Boyle and Father Cadmus Mazzarella, pastor of Our Lady of Peace Parish, presented Mancuso with a framed print of Brother Mickey McGrath’s “Christ the Teacher.” The painting shows Jesus with teaching tools that span centuries, symbolizing Jesus’ relevance for all generations. Patricia Mancuso, principal of Saint Mary School, Williamstown, accepts an image by Brother Mickey McGrath from Mary Boyle, superintendent of schools for the Diocese of Camden, and Father Cadmus D, Mazzarella, pastor of Saint Mary Parish. Eighth grader Meggan Bischoff thanked and congratulated Mancuso on behalf of Saint Mary Students. “We are so thankful to have you as our principal. You are very dedicated to our school and you put so much hard work into making our school the best. … We are truly happy that you received this award,” she said. A principal in the Diocese of Camden for nearly 20 years, Mancuso spent 12 years as a teacher — her dream career as early as fifth grade. “I used to ask if I could give the spelling test in school,” she confessed. Like many principals, Mancuso said she misses the hands-on aspects of the classroom, but she is proud of Saint Mary’s accomplishments and believes her path has taken her exactly where she was meant to be. She is particularly committed to professional development, making sure teachers are equipped with the tools they need to provide challenging academics. “The teachers never hesitate. They go along with me. They buy in,” she said. Saint Mary’s advancement director, Jackie Kern, appreciates the impact Mancuso has on families and students. “Mrs. Mancuso’s genuine concern comes across in every interaction she has, not just with parents, but with grandparents, siblings, as well as the students themselves. From her presence at open houses, to uplifting conversations with new and prospective parents, to greeting everyone with a joyful smile, Mrs. Mancuso exemplifies each and every day the Catholic values found here at Saint Mary School,” said Kern, who orchestrated the celebration of Mancuso’s award. Surprises for the day included the presence of Mancuso’s husband and three children, an overflowing basket full of cards made by every student in the school, and a large cake in her honor. When she returned to the school building after Mass, the hallways were lined with clapping, cheering students, faculty and staff members — a hero’s welcome for their Principal of the Year.